When temperatures are freezing, you’re likely to take a few extra precautions before heading outdoors. Among them: grabbing a coat and making sure your extremities are protected against the elements. Pets require special care in freezing temperatures, too. This time of year, pet parents are reminded that fur coats don’t offer all the protection pets need -- pets feel the bitter cold as easily as humans. To keep pets warm and safe in winter, experts recommend reducing outdoor activities. What else can pet owners can do to protect their pets during severe weather? Here are a few tips from experts. Forgo pet haircuts. Because longer coats give dogs more insulation, the ASPCA advises against shaving your dog in the winter. If you have a short-haired pup, consider having him sport a winter coat or sweater with a high collar or turtleneck in cold weather. Wipe down your pet. Make sure to wipe down your pet’s belly, legs, and paws. 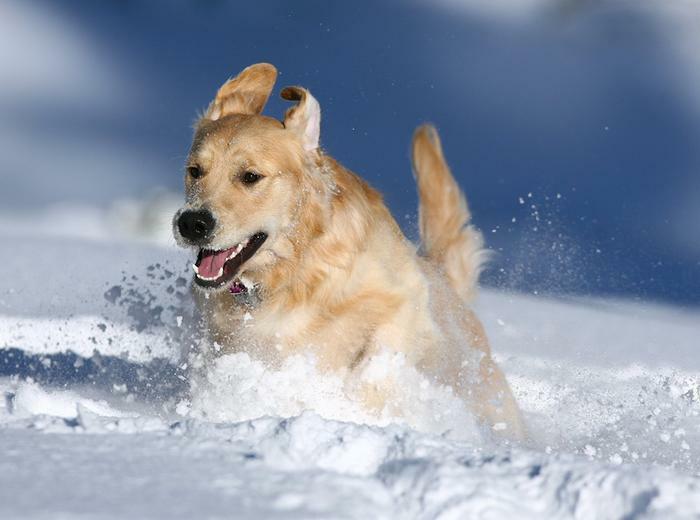 Paws caked with snow, salt, and ice-melting chemicals can irritate and even harm your pet if licked or swallowed. If possible, apply petroleum jelly or another paw protectant to your pet’s paws before venturing out for a winter walk. Give extra food and water. Pets tend to burn a little more energy in the winter trying to stay warm. For this reason, experts recommend feeding your pet a little extra during winter months. Additionally, make sure your pet has access to plenty of clean, fresh water -- dry winter weather can be particularly dehydrating. Reduce baths. Baths can strip your dog of important essential oils, so fully bathe your pooch as little as possible during cold weather. If a bath is necessary, use a moisturizing shampoo and/or rinse. Just hoping to de-stink your dog? Consider using dry shampoo. Provide a warm place to sleep. Keep your dog comfortable and toasty at night by setting up a warm place to sleep. A pet bed with a blanket or pillow will work, as long as it’s off the floor and away from drafts. Keep an eye on pets. Many pets get disoriented and lost in winter, so be sure to keep your pet on a leash when outside. Finally, remember that if it’s too cold for you, it’s too cold for them -- let dogs and cats come inside when it’s very cold outside.